2: Saskatoon Blades centre Kirby Dach promises to be a focal point of the game, as he’s in the #2 spot among North American skaters in NHL Central Scouting’s midterm rankings. 3: The Kelowna Rockets lead the way with three players at the prospect showcase, as forward Nolan Foote and defensemen Kaedan Korczak and Lassi Thomson will represent the WHL club. 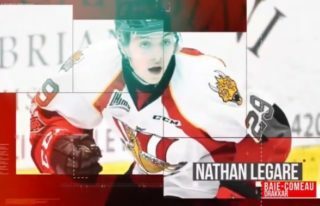 9: For nine years running – a CHL record – the Sault Ste. Marie Greyhounds have sent at least one player to the prospect showcase, as this year’s distinction goes to centre Joe Carroll. 15: Both the OHL and WHL will see 15 players skate in the showcase, including the Lethbridge Hurricanes’ Dylan Cozens and the Barrie Colts’ Ryan Suzuki, while the QMJHL has sent 10 players. 16: Sixteen players between the two squads aren’t the only member of their family to be involved in hockey, but none may be more prominent than Suzuki, whose brother Nick plays for the Guelph Storm and is a Montreal Canadiens prospect, and Foote, whose father captured two Stanley Cups over 19 NHL seasons. 18: Eighteen players competing in the showcase have been graded as ‘A’ Players to Watch by NHL Central Scouting. That list includes the likes of Cozens, Dach, Kootenay ICE captain Peyton Krebs, and Vancouver Giants defenseman Bowen Byram, among others. 26: Canada will be the most represented country, leading the way with 26 players, including nine from Ontario, six Albertans, five from Quebec, three from British Columbia, and one each from Nova Scotia, Saskatchewan, and Yukon. Russia and the United States are next on the list, with four players each. 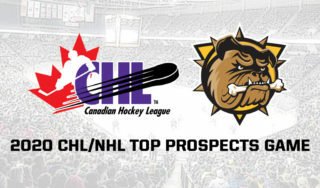 31: The London Knights have pushed their high-water mark to 31 players who have suited up at the prospect showcase, the most-ever by a CHL franchise. This year’s representatives are left-wing Matvey Guskov and centre Connor McMichael. 73: With 31 goals and 42 points on the season, Prince Albert Raiders centre Brett Leason enters the prospect game with 73 points, good for seventh in CHL scoring and the most among his showcase competitors. 1999: Back to Leason, the 1999-born late bloomer is the oldest player competing in this year’s showcase after he went unselected in the previous two NHL drafts. It’s a quick return to the big stage for the Calgary native, who was a part of Team Canada at the 2019 IIHF World Junior Hockey Championship.